When you think "geothermal," you may also think "expensive," but that's not the case with the Well-Connect hybrid geothermal system! Factoring in available incentives, a Well-Connect system can typically be installed in 1 day for about $6,000 to $7,000. Most Well-Connect owners 100% finance their system for about $69 per month. 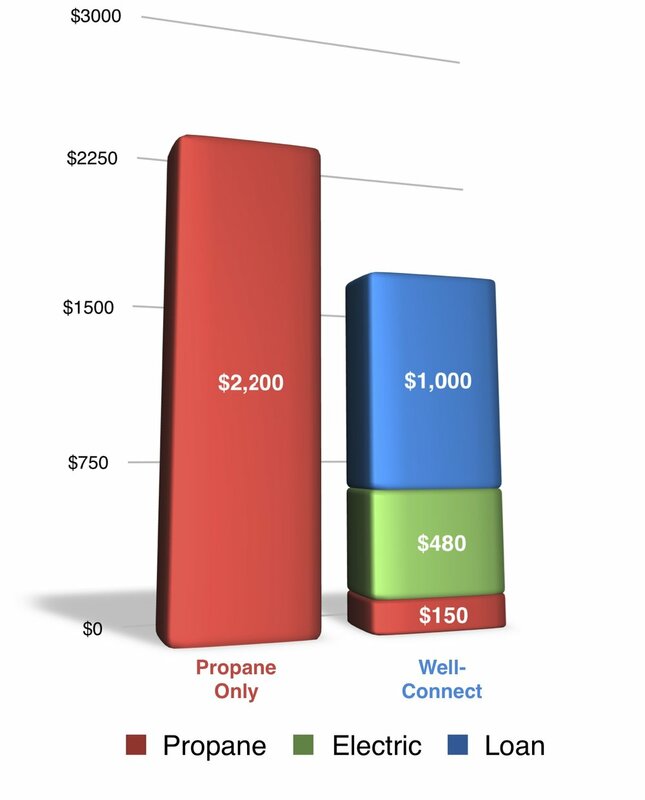 A Well-Connect can reduce a homeowner’s propane consumption by 900 gallons or more each year. At $2.00 per gallon, that’s a reduction of $1,800 per year. A Well-Connect uses about 5,000 kWh of electricity to operate. So, at an electric rate of $0.10/kWh, that’s a cost of $500. This yields a savings of $1,300 or about $108 per month. A Well-Connect pays for itself. Purchasing a Well-Connect is one of the best things you can do for the environment and for your bank account. Federal, state and local governments, as well as utility companies, recognize this and have created a range of financial incentives and financing programs to make it easier to get a Well-Connect in your home. When homeowners use ultra-high efficiency, green methods and spend less on their energy bills, everyone wins. Homeowners who install a Well-Connect are eligible to get a federal tax credit equal to the 30% of the full system cost. This includes the cost of the system and the installation. This means that you get to take 30% of the total price of your system (almost 1/3) and reduce your taxes by that amount. Refer to IRS form 5695 and consult with your tax advisor. Note that for calendar years 2018 and 2019, the credit is 30%, then dropping to 26% in 2020 and 22% in 2021. So act soon. Many states and regions offer rebates for installing a Well-Connect in your home. Yes they will actually pay you money to install a Well-Connect. These incentives vary by region but range from hundreds of dollars to thousands of dollars. You can find a pretty comprehensive listing of incentives (both from the government and your local utility) at http://www.dsireusa.org/ by using your zip code to see what’s available in your area. The list can be a little daunting, so when you are ready to buy, our representatives can help you identify which ones you qualify for so you can take full advantage of what’s out there. Electric utilities have also recognized the advantages of the Well-Connect in reducing emissions, smoothing electrical loads and improving overall energy efficiency and many utilities are offering incentives to encourage homeowners to make smart decisions. Some utilities offer cash rebates or credits when you install a Well-Connect, and most give a steeply discounted electricity rate to their customers. 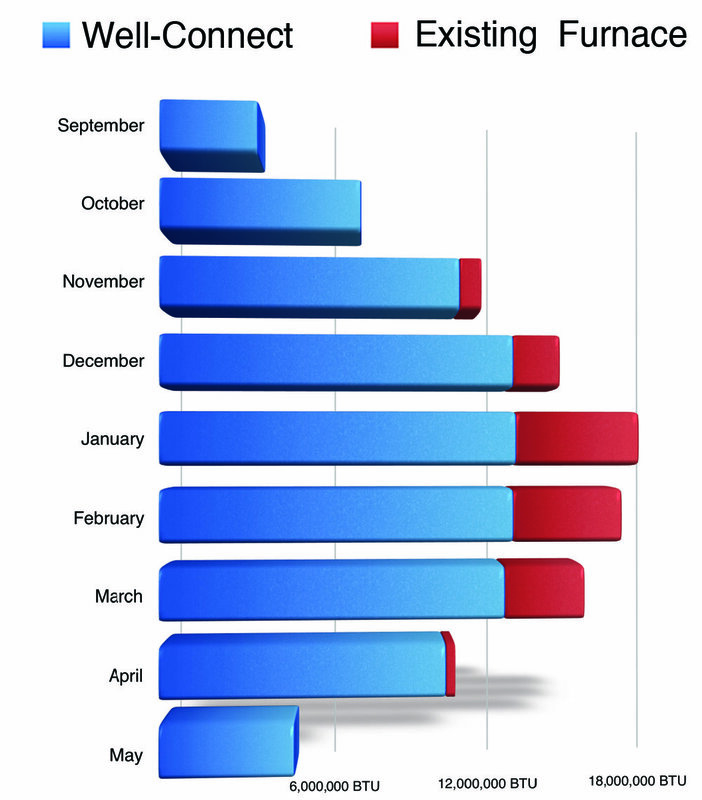 It’s always best to speak directly with your utility company though as new incentives are being added all of the time. Again, our representative can assist you with this. A Well-Connect system will handle a majority of your home’s heating needs with your existing furnace helping out in the coldest months. 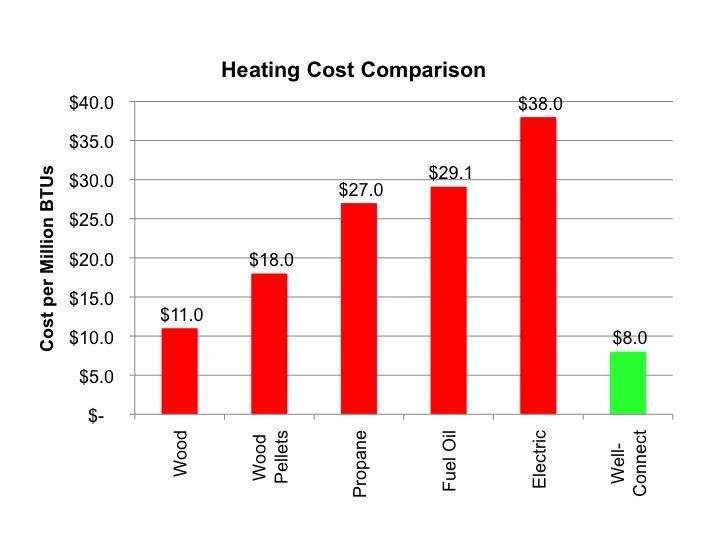 Well-Connect is by far the most affordable way to heat a rural home.